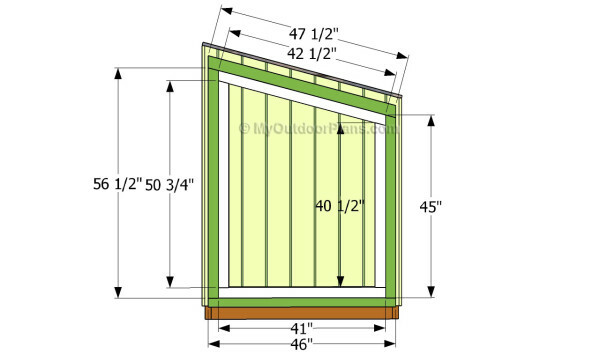 This step by step diy project is about how to build a door for a generator shed. 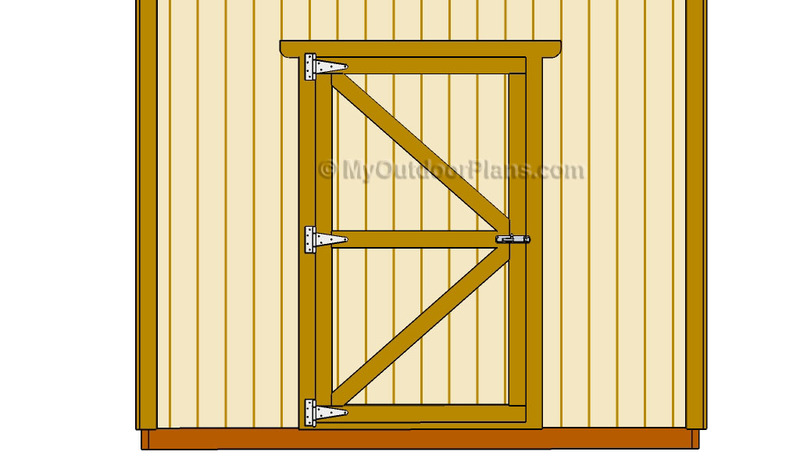 Building a door for a small lean to shed is a straight forward process, if the right plans are used. Cover the roof of the shed with plywood, tar paper and asphalt shingles, in order to protect the generator and your tools from bad weather. Make sure you take accurate measurements before making the necessary cuts. We strongly recommend you to take a close look over the rest of the project, as to see how to build the floor and the frame of the generator shed. Afterwards, you should invest in quality materials, as the effort will pay off on the long run. Always plan every step of the project, in order to keep everything under control and to prevent mistakes. Protect the wooden components from decay, by applying several coats of paint. 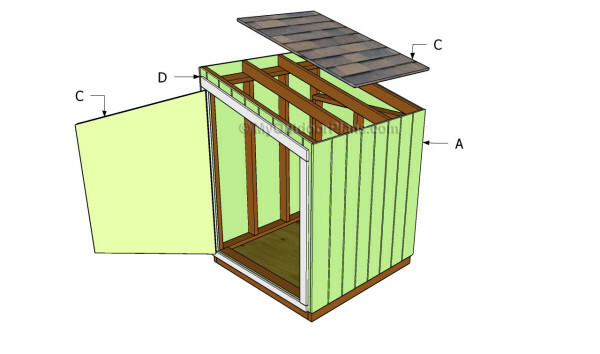 Top Tip: We strongly recommend you to take a look over the rest of the project, if you want to learn how to build the base and the frame of the generator shed. 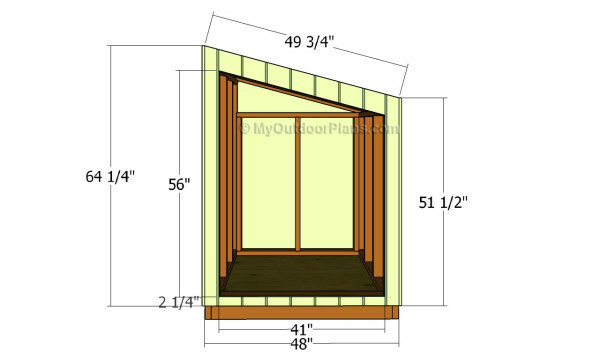 The first step of the project is to attach the 5/8″ grooved siding to the frame of the shed. 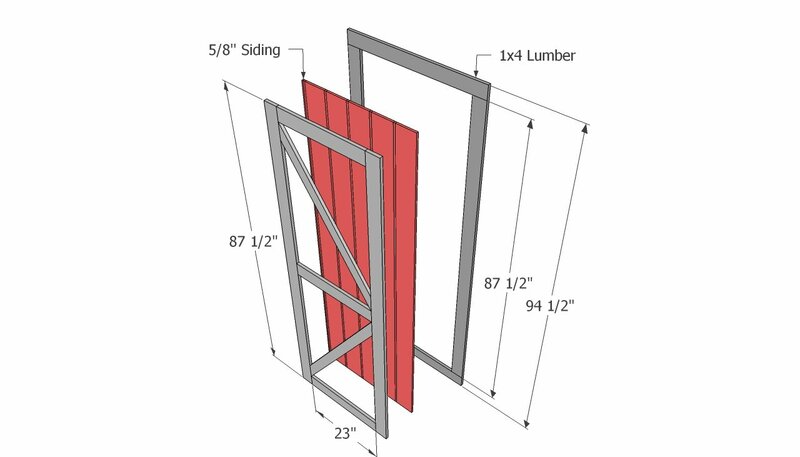 As you can see in the image, you need to cut out the door opening form the siding, using the information from the plans. In order to get the job done in a professional manner, we recommend you to take accurate measurements, to mark the cut lines on the grooved plywood with a pencil and to make the cuts with a jigsaw. 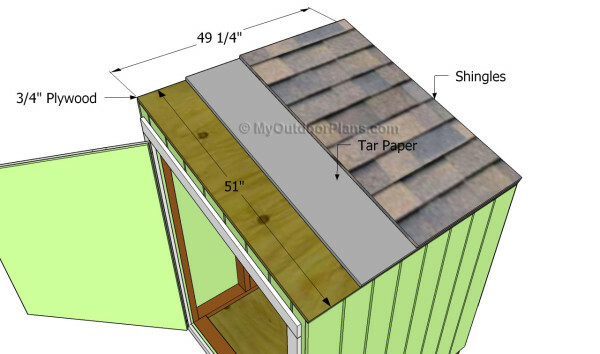 Continue the project by installing the exterior siding to the sides of the shed. After aligning the pieces of plywood at all ends, we recommend you to insert 1 1/4″ finishing nails into the framing. Make sure the nails are galvanized, to protect them against rust. 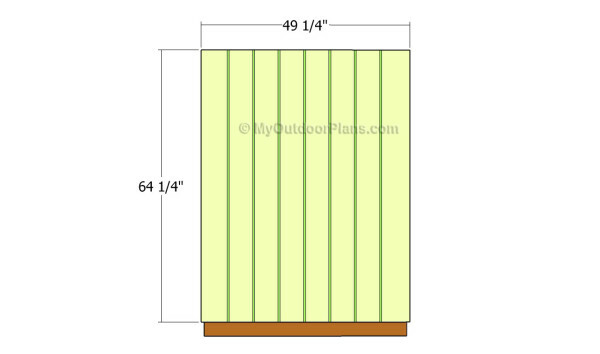 The plywood sheets are 48″ wide, so you could just center it to the frame, or cut a strip to cover everything. Cut the opposite piece of siding to the right dimensions and lock them into place with finishing nails. Male sure there are no gaps between the sheets of siding. Attaching the roof of the generator shed is a straight forward process. Cut a piece of 3/4″ plywood and lock it to the rafters with 1 1/4″ screws. Next, cover the surface with tar paper, making sure the strips overlap at least 2″. Install the starting row of shingles with the tabs upward oriented. Afterwards install the 3-tab shingles, making sure you follow the manufacturer’s instructions. The shingles should overhang 1 1/2″ on all edges, in order to protect the components from water damage. One of the last steps of the project is to build the door of the generator shed. In order to get the job done in a professional manner, we recommend you to use the piece of siding that was cut out of the front panel. Attach 1×3 trims around the edges of the door. Attach trims around the door opening and attach the door into place with metal hinges. In addition, fit a door latch. After building the frame of the shed an installing the siding, w recommend you to pay attention the finishing touches. Therefore, check if all the screws are inserted properly and sand the surface with medium-grit sandpaper. Top Tip: Apply several coats of paint over the wooden components, in order to protect them from decay and to enhance the look of the construction. Place the shed on a few 4×4 skids. 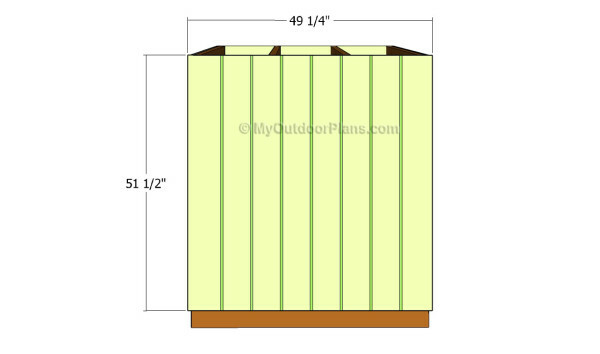 This woodworking project was about generator shed plans. If you want to see more outdoor plans, we recommend you to check out the rest of our step by step projects. 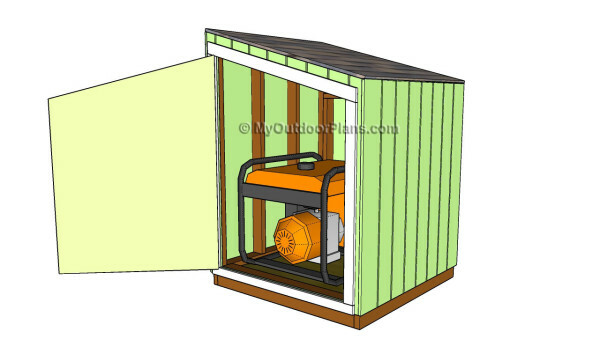 I subscribed, but cannot print the generator shed plans. To print the project, you need to press the green icon at the bottom of the articles or the floating one on the left of the page. The icon has a printer illustration. I’m looking forward to seeing your project.